I love birds - they are so sweet and beautiful. 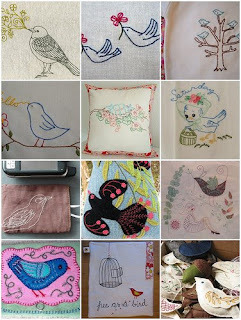 I found many lovely embroidered birds done by some very talented ladies in the Flickr Embroidery Pool - here are a few of them...Enjoy! I liked your love bird pillow so much, that I made one too. These are wonderful - and perfect for this time of year! I'm glad these were posted, as I would like to do a bird themed embroidered skirt for myself. I adore birds, as you can see by my blog banner:) Keep up the eye candy. thank you so much for including my box of birds!